There’s always a party when you have a grab bag! Now go make art. International Zine Month is all through July! More info here. 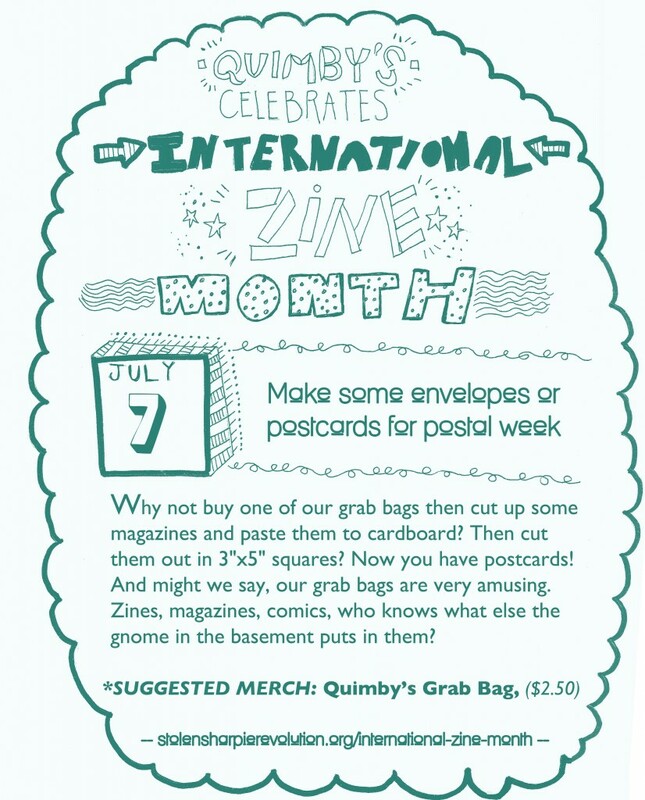 Tags: 420, art, grab bags, International Zine Month, IZM, mail art, postal art. Quimby’s Bookstore Podcast #3 Is Up! 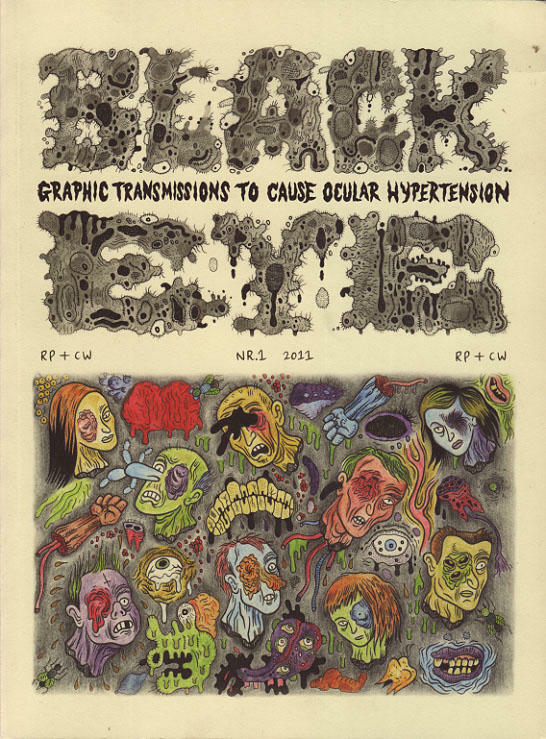 Editor Ryan Standfest discusses BLACK EYE 1: Graphic Transmissions to Cause Ocular Hypertension, an anthology that collects original narrative comics, art and essays by 41 international artists and writers, all focused on the expression of black, dark or absurdist humor. (And yes, we carry it at Quimby’s.) Ryan was here this past June 24th, to celebrate the Chicago release with some of the local artists included in the anthology. With comics and art by Stéphane Blanquet, Ivan Brunetti, Lilli Carré, Max Clotfelter, Al Columbia, Ludovic Debeurme, Olivier Deprez, Nikki DeSautelle, Brecht Evens, Andy Gabrysiak, Robert Goodin, Dav Guedin, Gnot Guedin, Glenn Head, Danny Hellman, Paul Hornschemeier, Ian Huebert, Kaz, Michael Kupperman, Mats! ?, Fanny Michaëlis, James Moore, Tom Neely, Mark Newgarden, Paul Nudd, Onsmith, Emelie Östergren, Paul Paetzel, David Paleo, Martin Rowson, Olivier Schrauwen, Stephen Schudlich, Robert Sikoryak, Ryan Standfest, Brecht Vandenbroucke, Wouter Vanhaelemeesch and Jon Vermilyea. Original essays by Jeet Heer (on S. Clay Wilson), Bob Levin (on “The Adventures of Phoebe Zeit-Geist”), Ken Parille (on Steve Ditko) and Ryan Standfest (on Al Feldstein and EC). Also includes the text “100 Good Reasons to Kill Myself Right Now,” by Roland Topor, translated into English for the first time by Edward Gauvin. You can find us on podbean or on I-Tunes (just do a search for Quimby’s Bookstore. And don’t forget to subscribe to the podcast at either of those places. And yes! Subscription to the podcast is FREE. Tags: art, Black Eye, comics, essays, podcast, Ryan Standfest. Gigposters.com Founder Clay Hayes Brings His Gig to Quimby’s With Artists Featured In the Book, Just In Time For Pitchfork Music Festival! You’re used to seeing gig posters, flyers, and handbills displayed outside your favorite concert venue. Now, with Gig Posters Volume 1: Rock Show Art of the 21st Century (Quirk Books), artwork featuring your favorite musicians can be found in a lasting book format. Each of these posters originates from Gigposters.com, which has been the Internet’s first and best resource for concert art since 2001. Their massive online database showcases more than 100,000 posters from 8,000 different designers, including all of today’s top poster studios. Gig Posters Volume I highlights the best examples from that collection. Inside you’ll find artwork promoting shows by Radiohead, Kanye West, Wilco, the Decemberists, the Shins, the Beastie Boys, Arcade Fire, Sleater-Kinney, Cat Power, Joan Jett, Wu-Tan Clan, N.E.R.D., Diplo, and many, many, many more. Organized by designer, each page features an artist along with their insights on influences, methods and mediums, and why they do what they do. Author Clay Hayes is the founder of Gigposters.com. Read a helpful interview with him here. Like all events at Quimby’s, this event is free! Tags: art, clay hayes, Event, events, posters, store event, Store Events. Multi-talented Chicago artist Archer Prewitt (The Sea and Cake, The Coctails) signs his new book, Work On Paper! Not many people will know that the author of crazy and perverted comic, Sof’ Boy, is the same man who drew the beautiful and delicate nymph-like girl from the artists’ own music album, Wilderness. But look carefully and you will notice that the most intricately drawn fine lines and dots are mutual features of much of his work; the same organic, subtle, sophisticated and tender sensibility shine through in all of Archer Prewitt’s creations and never ceases to charm us. This book collects 32 of selected works from a group of minimal drawings he has been working on for almost 20 years. Foreword by Jim Harris (Courtauld Institute of Art, London). Tags: Archer Prewitt, art, event. store, presspop, Store Events, Work On Paper. In the neighborhood? Spend some time basking the glory of our new window display by artist Zachary Huelsing (of Eyerocket Books). With a cast of characters including a nun, a rapper, a baseball catcher, a calculator, a leather daddy, some dogs in love, and a rainbow, it’s kind of like a technicolor rebus for the forces of good. Tags: 2008, art, display, rainbow, rebus, summer, windows.